Chris Narveson didn’t get the win tonight against the Padres, but that wasn’t his fault. You’d think the Brewers hitters would be able to get one across home plate in 7.1 innings of shutout baseball, but no cigar. So Narveson sits at 2-3, again the victim of the Brewers’ failure to knock in runs. He has quality starts in all but three games this season (two if he gets another out in Washington on April 15). And yet the Brewers have managed to win only two of those games. The position players better cork the bats as an apology on his next start. Like most Brewers fans, I’d have scoffed if you’d have told me at the beginning of the season that come June, Narveson would have a better line than Yovani Gallardo. Yet that’s exactly the kind of season he’s put together. The point is not that Gallardo has had a disastrous season, though it hasn’t been very good (5-2, 4.70 ERA, 1.48 WHIP, 1.85 K/BB). 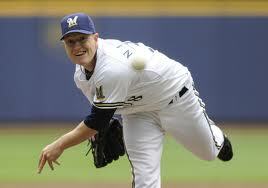 The point is that we have to start taking Chris Narveson seriously as a legitimate force in this rotation. This entry was posted in News and tagged Brewers, Chris Narveson, Milwaukee. Bookmark the permalink. Jose Bautista, home run king?